Where was the most extreme precipitation yesterday in the West? Sign up to receive an automated “R-Cat Extreme Precipitation Alert” email from CW3E showing the most extreme precipitation events over the previous 3 days (only on the rare days when there is extreme precipitation). The attached map shows the locations of 52 such reports from the storm that hit the West from 7-10 January 2017. 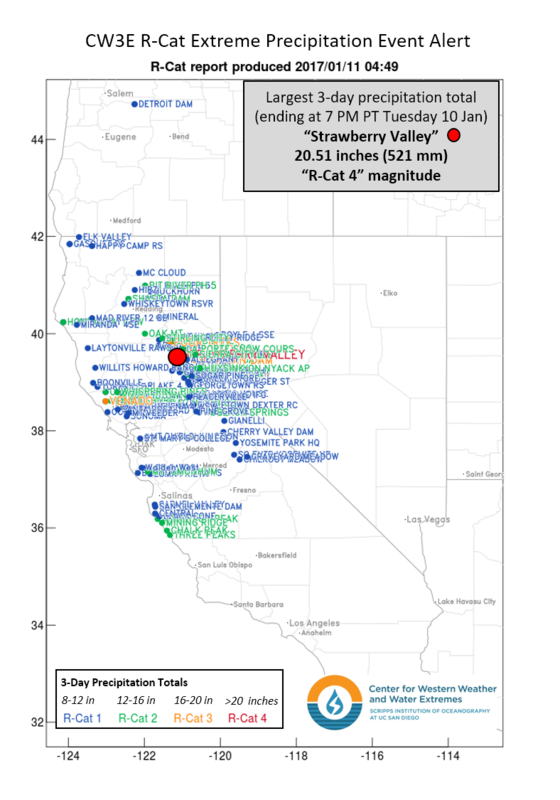 The maximum three-day precipitation during the weekend event was 521 mm (20.51 inches) at a location called Strawberry Valley on the western slopes of the Sierra Nevada Mountains, about 1,161 meters (3,807 feet) above sea level, near Interstate 80. That made this an “R-Cat 4” extreme precipitation event on the CW3E’s scale. This is the top magnitude possible and is very rare. “R-Cat” stands for “Rainfall Category,” a simple scaling system invented by CW3E’s Marty Ralph and Mike Dettinger (see brief journal article here or here). 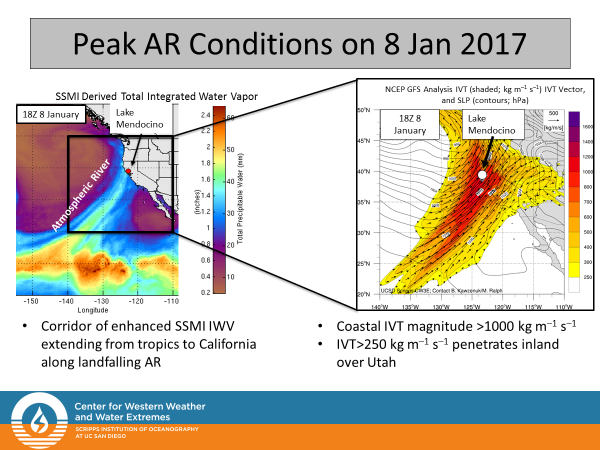 The landfall of a very strong long-duration atmospheric river (AR) (see second figure) followed by a second AR in California over the last few days produced extreme precipitation over much of Central and Northern California. This event was identified and reported in real-time by a new tool developed by David Pierce and Marty Ralph at CW3E that automatically monitors rain gauges across the Western U.S. and sends an email alert when extreme precipitation events occur to anyone signed up for the service. The service is free and is intended to provide information to interested individuals in a timely manner. To subscribe to this automated CW3E R-Cat Extreme Precipitation Alert via email: just email a message with subject “subscribe” to rcatalert@cirrus.ucsd.edu. For comparison, the number of R-Cat 3 or 4 events annually roughly matches the average number of major hurricanes that occur annually in the Atlantic (Cat 3, 4, 5 combined) and the number of the most extreme tornadoes that occur (EF-4 and 5 combined). Notably, in light of the events of last weekend, it is useful to note that, in the Western US between 1948 and 2010, 44 of the 48 occasions when RCAT3 or RCAT4 conditions were reached coincided with the arrival of an atmospheric-river storm.